Frescoes was shot in the Armenian city of Giumri that was almost completely destroyed by an earthquake in 1988. Soon after that tragedy Armenia gained independence. Happiness and misfortune always go hand in hand. The earthquake destroyed one city, but built another-the city of the dead, the cemetery. The central figures of the film are the boy Varuzh, a priest, a grave-digger, and two cemetery stone-masons. 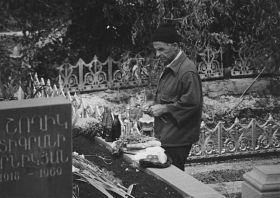 They spend their days at the cemetery and only return to the city at night, to the real life which deeply resembles their other existence at the cemetery. This film is about life on the boundary between the city of the living and the city of the dead, on the boundary between childhood and the adult life. The film is about a boy who will save his city, his country, with his optimism and his lust for life. Alexander Gutman has made films for nearly three decades and has more than 50 documentaries and 100 commercials to his credit. His portraits of musicians and athletes and depictions of the everyday lives and concerns of Russians and people from surrounding nations have received international acclaim and won awards at film festivals on three continents. He has also worked as a television reporter in six countries and lectured at universities in Europe and the United States.